An alchemist peddles a new magical invention—and the key that could unlock Lettie Peppercorn’s family secrets—in this quirky “tale of self-discovery, family, and friendship” (The Independent). Lettie Peppercorn cannot go outside. Ma told her so right before Ma disappeared forever. So Lettie’s house is on stilts, and she is stuck with only the wind and a pigeon for a friend. Nothing exciting has ever happened to her—until the night a strange merchant appears. But snow is not the only secret he holds. The alchemist knows where Lettie’s Ma is. And Lettie will do anything to get Ma back—even if it means risking her own life. On a winter night so cold and dark the fires froze in their hearths, snow came to Albion. It came packed up in the suitcase of a stranger. Lettie was the first to see him. The stranger walked up from the harbor, dragging his luggage bump bump bump over the cobbles of Barter town, searching for the sign of the White Horse Inn. He found it on Vinegar Street, swinging from the porch of a house on stilts. Up above, through the little kitchen window, Lettie the landlady watched him come. With her telescope, she traced the long line of footprints etched behind him in muddied frost. She saw him put a hand on the ladder that led to the door and start to climb, up through the black and swirly night. The Wind was so strong it could have whisked away the fingers from his hands, and he wore no gloves. It was the coldest winter Lettie had ever known, and he was by far the coldest guest. The whites of his eyes were blue, and his pupils were white. Periwinkle cocked his head and Lettie sighed. For a pigeon, he was a good listener, but he was terrible at conversation. Lettie closed her telescope with a snap and dropped it in her apron pouch. She went into the tiny front room, where her two guests—a Lady from Laplönd and a Bohemian jeweler—sat in armchairs by the hearth. Their real names were signed in the guestbook, but Lettie called them the Walrus and the Goggler. The Lady was the Walrus, because she was fat with whiskers. The jeweler was the Goggler, because she did nothing but stare. They suited Lettie’s names better than their own. “Someone’s coming up,” said the tiny, shrunken Goggler. She hooked her scopical glasses around her ears and flicked down the lenses to glare at the door, her eyes big as saucers. “He will not be having my bed,” said the Walrus. Her wobbly lipstick pouted, her piggy eyes squinted, and her treble chins shook. Lettie had no time to answer before the door flew open. On the porch stood the man with the icicle beard. At once, the fire died down to embers. The Wind swept in, and before the Walrus could cover her ears, it snuffed out the ten tiny candles on her chandelier earrings. His smile made a cracking sound, and a shard of his icicle beard fell to the floor. Lettie stared. With jitters in her belly, she went to pick up his suitcase, but he shooed her with his hand. The Walrus and the Goggler watched from underneath their furs. Now here was someone—a frozen man with a suitcase full of mystery—telling her that she was his customer. 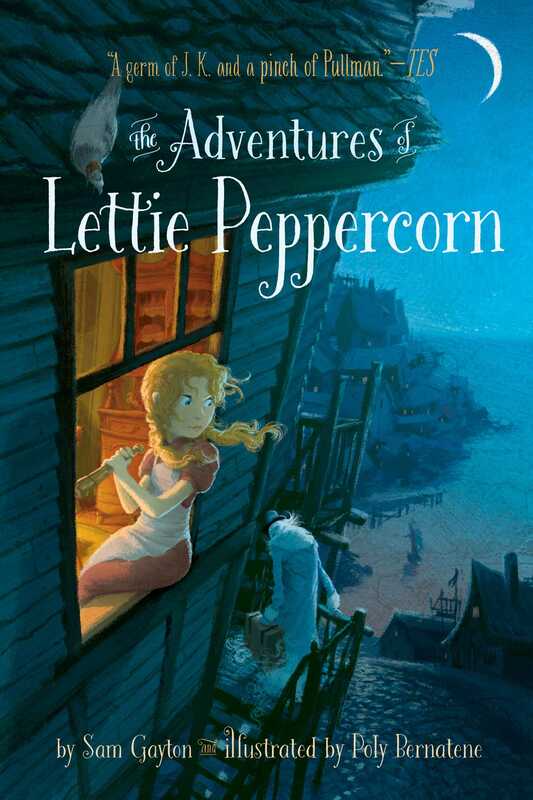 Lettie Peppercorn, stop your gawping and say something, she thought. Lettie followed the stranger’s gaze as it swept around the tiny room. The White Horse Inn was drab and bare. The pictures were gone from the walls, leaving dark squares on the wood. There was a dining table by the kitchen, two armchairs by the fire, and Ma’s old pianola in the corner. There was one rug left. It was small. “It looks cold enough,” he said. “But all our beds are full,” said Lettie. Lettie was in half a mind to give him a lecture on good manners and send him packing. But she couldn’t. The White Horse Inn needed money. Da’s gambling already had Mr. Sleech, the debt collector, knocking at the door each week. So instead of a telling-off, she gave the stranger a smile and showed him her wide, wonderful eyes: the eyes of her ma, long gone. “Three shillings is reasonable . . .” began the Goggler. “. . . for an inn with more than one rug,” finished the Walrus. Poly Bernatene was born in 1972 in Buenos Aires, Argentina, and has been drawing ever since. He graduated from Buenos Aires’s art school, where he developed a great interest in managing different techniques in his work, which has always been based on experimentation and diversity. Poly’s work is constantly changing and developing as he looked for new ways to tell stories. He has worked in advertisement, animation, and comics. During the last fifteen years, he established an exciting career as a professional illustrator, having published more than sixty children’s books in eleven countries. Hand this title to fans of Roald Dahl. This British import combines familiar fantasy elements and quirky details to create a tale filled with transformation and danger...Gayton uses fanciful language that adds to the fairy-tale feel while also painting fiercely frightening portraits of his various villains. "A germ of J.K. and a pinch of Pullman." Full of fairy-tale and fun, which should appeal to Lemony Snicket fans. "What ensues is a magical adventure over sea, into icebergs, and around a whaling ship, reminiscent of Roald Dahl and Lewis Carroll."